Russ and Connie McFee knew there had to be a solution for a better face down chair. This is how they made it happen. 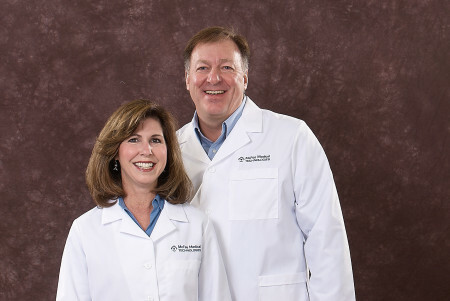 As co-owners of McFee Medical Technologies, Russ and Connie have been involved in vitrectomy equipment rental for over 20 years. After hearing feedback from patients using face down recovery equipment, they began experimenting years ago with inventing proprietary products that would make recovery more comfortable and convenient. Over the last two decades, the McFee Medical Technologies team has invented the EZ Sleep, the most comfortable customized sleeping system available, and the Rollover Alarm, which alerts patients if they roll over from the face-down position. Their latest and most in-depth innovation is the EZ Chair. The EZ Chair is the only motorized face down chair on the market. 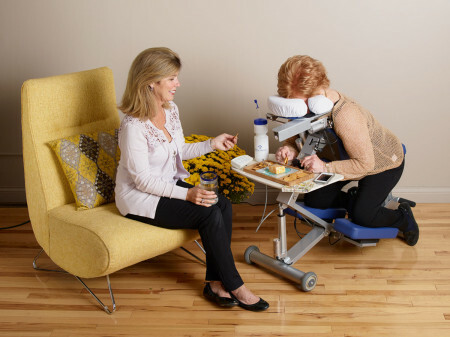 It is by far the most comfortable and convenient chair available for vitrectomy recovery, macular hole surgery recovery, and any other face down recovery need. Here’s how they did it, according to Russ. Q: How long did it take to develop the EZ Chair Face Down Chair? Russ: The idea for a better vitrectomy chair started about 10 years ago. We wanted to create a chair that was easy to adjust, easy to get onto, and very comfortable for long-term face down recovery. We originally created it as a manual, mechanical chair. Then, we decided it really should be motorized for convenience. From when we first started drawings and prototypes, it took about two years of development. We made an initial run of two prototypes. Then we worked with our manufacturer to create a small production run of an initial 10 units. We have now just completed a run of 25 brand new chairs. Q: What was the testing process for the EZ Chair? We sent a focus group of patients both our traditional Seated Support and the EZ Chair. They compared the features and provided us feedback. Based on their feedback, we made small alterations before making the final production run. Q: What are the benefits of the EZ Chair? The EZ Chair really makes face down recovery easier. We have had a number of patients doing a second rental after a second surgery. From those who have used both the EZ Chair and the traditional chair, we hear consistently that there is hands down no comparison. The EZ Chair is so much more comfortable, and it makes it so much easier to stay facedown, which is key to a successful recovery. 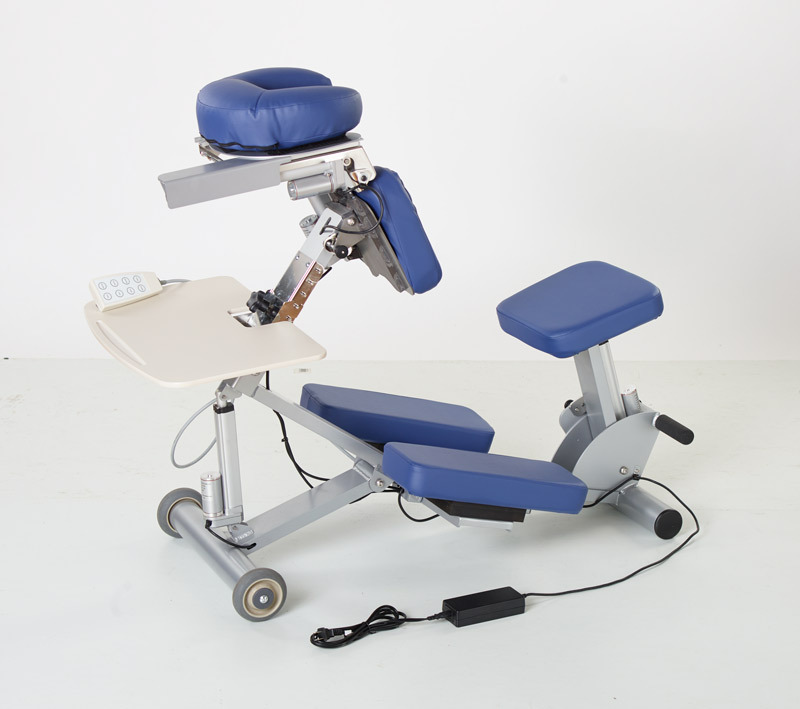 The EZ Chair is also much more convenient to set up and adjust. With the traditional face down chair, you have to get on it, determine if any parts need to be adjusted, then get off and adjust the parts. This really should be done before the surgery. With the EZ Chair, adjustments are made with a push of a button while you’re on the chair. You barely have to move to shift positions or adjust for comfort. We specifically designed the EZ Chair to have a step-through design. That means you don’t have to swing your leg up and over to get on it. For those with limited mobility in their hips or knees, this is a huge benefit. Q: What was one of the biggest challenges in designing the EZ Chair? One of the most difficult challenges was designing the chair so it could fold small enough to ship regular UPS Ground in an easy-to-handle box. We wanted the box to be simple and light enough for customers to get into their homes. It also needed to be easy to unfold and set up. It took creativity, but I’m glad we were able to accomplish it. Q: What do you believe sets McFee Medical Technologies apart? We have a true commitment to having the best experience and equipment for the people who rent from us. Face-down recovery is a difficult and overwhelming prescription. We want to make it as easy as we can for our customers. We are proud of our line of proprietary vitrectomy recovery equipment, including the EZ Sleep (the most comfortable sleeping system available), the Rollover Alarm, and the EZ Chair. We are the only company that manufactures our own vitrectomy equipment. Other companies just buy off-the-shelf massage equipment for their rentals. Our equipment is specifically designed for long-term face down recovery, which we believe honors our commitment to our customers. Rent the EZ Chair in one of our rental packages.